I am kind of hoping this one leads onto something a little nicer to listen to. My ears are burning already. Is that a cornet or a trumpet? 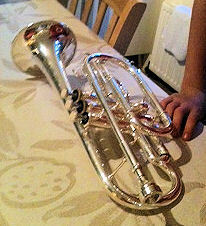 Nice and shiny, my trombone is never that shiny!! It’s a cornet. They had to pick from 10 cases, and it was pot luck whether they got a cornet or a trumpet. They sound the same to me. All buffed up and ready to go! Certainly is. The noise has driven me nuts this week. He just “has” to practice.